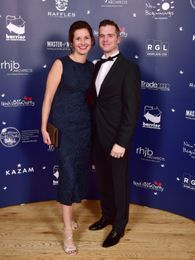 12.12.15 NBC XMAS BALL - AMAZING SUCCESS!! What an incredible turn out of supporters for NBC #TeamNoah. 180 guests joined us for our evening of entertainment. With a raffle, live and silent auctions and the exceptional generosity of our guests, sponsors and donators the evening raised in excess of £16,000.00!! We can't thank enough the truly amazing support received. Noah's Big Charity is making a difference and will continue to do so in 2016!! Below. 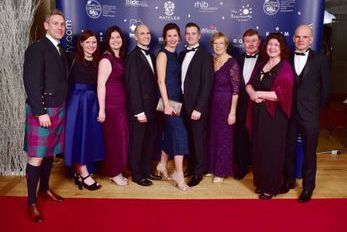 Guests arriving at the Xmas Ball on the red carpet entrance. 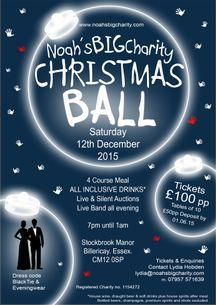 Well after several months in the planning Noah's Big Charity Christmas Ball all kicks off tomorrow evening. It's shaping up to be a fantastic night, with over 180 guests coming. Big thank you to our sponsors Raffles, Master of Malt, New Beginnings Day Nurseries, Barrier Air Conditioning, Kazam, RHJB Architects, Trade Copiers, RGL Displays Limited & Reprohouse. The nights doing great before it's even started!! 23.10.15 NBC have done it! 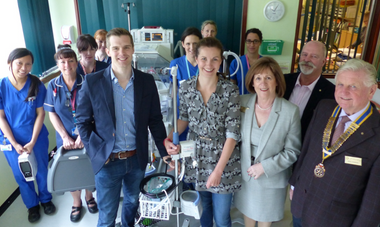 After months of red tape, NBC have funded a £35k bedside Utlra-sound machine for the Royal London NICU! It is in operation and making a significant difference on ward. The consultant and wider team at RLH extend their warmest thanks to the extended NBC family who have made this possible. THANK YOU all of you who make #TeamNoah. Right: Lydia & Richard join members of the NICU team at RLH for the arrival of centre stage the Bedside Ultrasound machine and left the Criticool unit previously funded by NBC. Noah's Big Charity - Making a Difference! Huge congratulations to Angela and Alice who cycled unsupported from the London Eye to Paris over three long days, a feat all the more remarkable as Alice was a novice cyclist! They raised a whopping £1,400.00 (inc GA). RIght. Angela & Alice across the water and in France on there fantastic ride. Congratulations to Jo & Maria, our two women team who completed the Thames Bridge Trek for #TeamNoah Thank you ladies. Right. Jo & Maria right: After completing their Thames Trek Challenge for NBC. Thank you ladies. One of our biggest supporters New Beginnings Nurseries held their third Big Toddle event supporting NBC! We deeply appreciate the efforts of the NB team, parents, friends and most of those brilliant little toddlers! Are magnificent 12 (with 9 Novices) smashed the AJ London Triathlon. Swimming in the docks, cycling and running in and around the ExCel Centre, on a glorious sunny London day was awe inspiring. #TeamNoah did the charity proud, as did our army of supporters cheering the team along all the way! Brilliant day of fun and a huge fundraising tally of over £8,000 thanks to some wonderful gift matching. Thank you top our #TeamNoah Family! 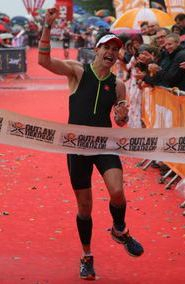 Congratulations to Andrew Hedges (A fellow Dad from NICU) and Alex Hargreaves who conquered the gruelling Nottingham Outlaw Ironman event as our 2 man #TeamNoah. They spent an average 1hr 20min swimming, 5hr 45min cycling then topped off with a 3h 51min Marathon run...... I'm out of breath typing it!! What an achievement. 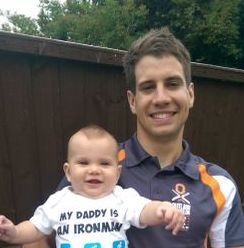 These two Ironmen raised over £2000.00. Hats off...Thankyou! (Left) Andrew finishing after 11.5 hrs with a roar. 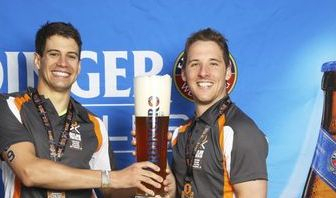 (Above) Andrew and Alex proudly clasp a small shandy after the event. So our 11 strong #Team Noah for London and 6 Ladies taking on the Clacton half enter the final prep weeks for their big events. Saturday 8th and Sunday 9th August respectively. Come the Team Noah!!!!!!!!!!!!!!! London to Brighton bike Ride Done! 26.06.15 SPERO LODGE Show their support for the 2nd Year running!! Members and friends of the Spero Lodge totalling some 51 golfers came together at burstead Golf Club to support NBC and Help for Heroes! The event saw some pretty sharp and some pretty blunt golf whilst magian to raise £1,250.00 for NBC! A colossal thank you to a group which has shown tremendous support for NBC since it's founding. Antony Richardson & Will Sorohan flying the NBC flag in Ireland, conquering the Hell and Back Endurance for #TeamNoah Good work boys! Now back to the pub! Above: Jade before the curling 13.1 miles of the Southend Half! Above: Will and Ant, bringing the Sun along for the ride! 11.06.15 "Read All About It!!" The Basildon Echo published a nice piece about us! Hopefully get noticed and get some more people on board! Thank you Matt & Dave. After a long winding road of NHS red tape, it's here!! We together with members of the Brentwood a Becket Rotary club who kindly donated £2000 to our latest £12,000 grant to Basildon NICU, presented 7 pieces of life changing equipment! Great Day! 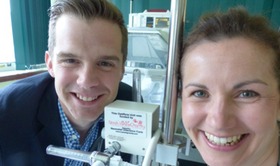 Above: Richard and Lydia with an Optiflow machine and Noah’s Big Charity plaque. Above: NICU nurses with (l to R) Richard and Lydia Hobden, of Noah’s Big Charity with Brentwood a Becket Rotary members Anne Bender, Mike Capper and Michael Hawkins. Longtime supporters New Beginnings Day Nurseries have become and official sponsor of Team Noah's Cycle and Triathlon Teams this year. There kind donation will help bring our teams together under the Team Noah banner, help raise awareness and curtail funds for our NICU units! Thank You to all the New Beginnings Team! Thanks to Peter and the team at Reprohouse who after providing Noah Hands for our supporters at the marathon are now printing up some posters for the golf day FOC! Great support from a cracking company! Thank you to all those attending on Friday and to the many companies who have provided prizes for the raffle on the day. Some fantastic donations! Well done #TeamNoah Adele, Tash & Rich (Below) and Tom 'the machine' Barritt (Right) for completing the London Marathon all with PB's whilst raising over £6,000.00! Brilliant! Noah shared a ward with our Noah for a couple of days and his parents have been kind enough to share his story with us. See our 'Little Adventurers' page and read 'Noah's Story'! Sam Vardy a fellow dad from RLH NICU completed the Brighton marathon in a fantastic 2h 55mins! Sam raised over £1800 for NBC! Great work #TeamNoah. Pictured right on Brighton Beech with his son Noah. Today marks 2 years since our little Noah passed away! 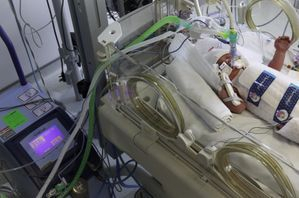 His legacy lives on through NBC and the support we have been able to offer our NICU units thanks to the incredible people that have trained, worked and donated to the Charity. We thank you all. The little guy... Missed every day! Inspiring for a lifetime! We received these photos last week from the RLH unit. this little chappy had a traumatic birth at Basildon and was transferred to RLH to use the NBC funded 'Criticool' machine giving him the best fighting chance. Good luck little guy! We're all rooting for you and your folks. Above: The little guy wrapped in a body suit filled with water supplied by the Critical machine. Lowering his body temperature. Left: Babies folks. Tough times but hopefully on the up. Special thanks to photographer Gary Schwartz & Sister Polly St John. NBC were represented by some #TeamNoah Veterans as well as some great supporters of the Charity Kath & Lee Charters who raised over a whopping £750 which is to be gift matched by Lloyds.... great effort which will go a long way to helping. Thank you to all who pushed through a tough 13.1miles. A huge thank you to Kath Charters and friends who arranged a work cake sale in support of NBC. These beauties must have been delicious as they raised £180 which is due to be matched by Lloyds... terrific help Kath... thank you! This photo arrived from The Royal London NICU in the last couple of days. 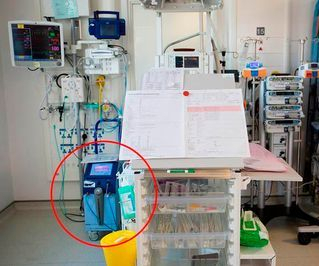 The equipment circled is the Criticool Unit funded by NBC. It is currently helping to save the precious life of a little boy who has had a traumatic start to life.... Absolutely amazing, if your reading this and you've taken part in an event or supported us in anyway... you did that! Thank you! 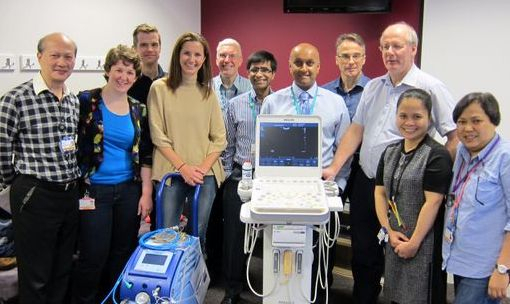 Right: Criticool Unit funded by NBC - making a difference to a baby boy on RLH's NICU Ward 8D! 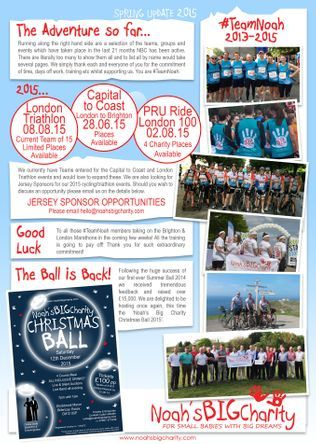 Great news as Law firm 'Morgan Lewis' have made us one of their 2 official charities for 2015! Chosen from 15 nominated. Thank you to fellow NICU parent Sam Vardy for the nomination. 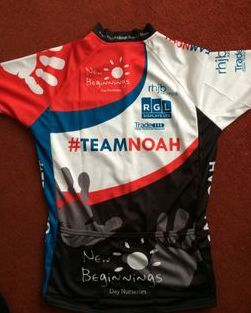 Thank you to Morgan Lewis also, it's great o have you as part of #TeamNoah. 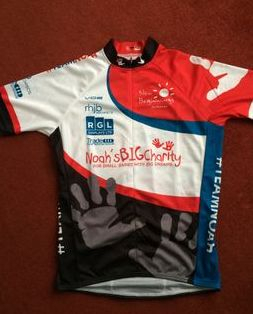 We have 4 shiny Charity places for #TeamNoah for this years Sold Out Prudential Ride London 100 event on 02.08.15. Want to take on this famous bike ride and raise awareness and funds for NBC then please get in touch. Minimum fundraise commitment applies. Today would have been Noah's 2nd Birthday. His story has touched so many, continuing to inspire us all to help make a difference. Missed everyday! COME ON THE NOAH! Need inspiration? Long time supporter of the Charity, Katie Burge, has entered the London Triathlon in August. Thing is Katie can't swim!! Katie had her first ever swimming lesson today on the road to the London Tri...... WOW, what a star, truly inspiring #TeamNoah!! FYI with some superb recruiting by Miss Burge we now have an amazing triathlon team of 17! Thank you to all the members of the Rotary Club of Brentwood a Becket, who kindly donated £2000 to fund a breathing machine within our next funding for Basildon NICU. Brilliant to have such local support and know that word of our Charity is spreading!